Paint is an inexpensive way to revitalize your decor. When working with paint, accidents can happen. Latex paint is a popular choice with painters due to its flexibility and fast dry time. It is water-based, which makes it easier to clean than oil-based paint. While painting your walls or ceiling, paint can splatter onto wood surfaces such as baseboards and hardwood floors. 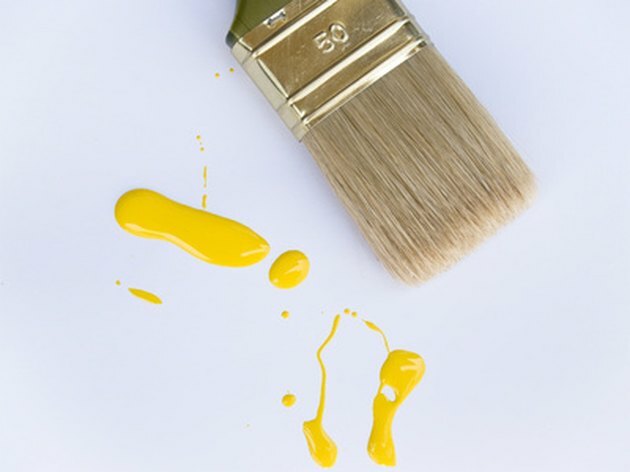 The ideal time to remove paint is before it has had time to dry, but it is also possible to remove dried latex paint from wood. Paint spills happen, but you can fix them even after the paint has dried. Scrape dried latex paint using a spatula or the edge of a credit card. Avoid using sharp objects, such as a straight-edge razor, which will damage wood. Use a toothpick to remove latex paint from small crevices. Mix 1/4 cup lemon juice with 3/4 cup rubbing alcohol in a container. Apply the mixture to a white cloth. Saturate the latex paint stain with the mixture. Use a brush and scrub the stain. Repeat this process until the latex paint has been removed. Apply denatured alcohol to a white cloth. Wipe vigorously to dissolve tough paint stains. Use a non-abrasive scouring pad to scrub the area. Reapply denatured alcohol to the white cloth often. Denatured alcohol evaporates quickly. Use a different part of the white cloth for each application to avoid transferring paint residue back onto the wood. Repeat the process until the latex paint stain is removed. Wipe the area with a clean damp cloth to remove any remaining debris.